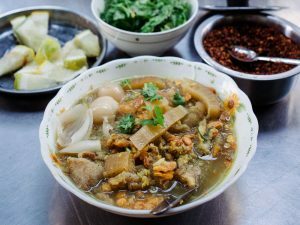 Often referred to as ar-pu shar-pu (hot throat, hot tongue) and as the name suggests, this dish of rice noodles and fish soup packs a punch. A perfect way to warm your cockles during the winter. It makes me think of mohingar as there are similarities, yet it has its own distinct taste. 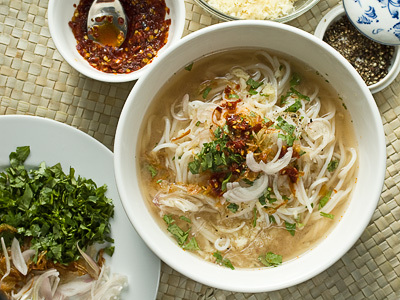 This dish comes from Rakhine state on the west coast of Burma. Earlier this year, I had a lovely email from Tinmala who shared her version of Rakhine moti recipe with me and this recipe is based on it. What I like about Rakhine moti is it can be eaten dry (thote) or as a noodle soup. The galangal gives the soup a robust earthiness with a slight citrus aroma. The tamarind juice and chilli sauce add the salty, sour and spiciness. Start the soup base. Put the fish in a large pan, add the water and turmeric. Bring to the boil and simmer for 6-10 minutes until the fish is just cooked. Remove the fish from the pan and when cool enough to handle, peel the skin and flake the flesh, discarding any bones. Squeeze the flaked fish, using a fine sieve or a muslin cloth until all the juices are removed. Add the fish juice to the soup then the remaining soup base ingredients. Put a lid on and let the soup simmer for 10 minutes. Season with salt. In a wok, heat the peanut oil and stir in the turmeric. When the oil has turned a vibrant yellow, add the flaked fish and stir fry for 10 minutes on low heat until the fish has become dry and very flaky. Season with salt. Keep stirring so you do not burn the fish. Season with salt and transfer to a bowl and leave to one side. The chilli sauce can be made in advance. In a small saucepan, heat the oil, add the dried chillies, water and fish sauce. Simmer briefly until the liquid has reduced, about 2 minutes. Pour into a small serving dish. For the garnishes, put the tamarind and water in a small saucepan and simmer for 2 minutes. Strain the pulp through a sieve to remove any fibres and stones, leaving the juice. Prepare the crispy shallots, cook the noodles according to the packet instructions and chop the coriander. To serve, put a handful of noodles in a bowl, some flaked fish and ladle over the soup. Let everyone add the garnishes as they wish. It should taste spicy, salty and tangy from the tamarind. 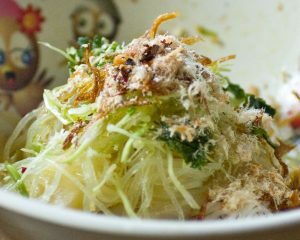 If you want to eat as a dry dish then assemble the thote with noodles, a generous amount of flaked fish, garnishes, chopped coriander and add a tablespoon of the oil used to fry the shallots. Serve the soup as a side dish. Perfect either way. I eat this with green chilli paste. Boil water in a sauce pan and add a handful of green chillies. When the chillies soften, drain the water and pound them or mash them until a paste is formed. Add a clove or two of garlic if you like. It is very hot but I like it. Thanks for your message. I like the sound of adding garlic to the green chillies – must try it next time. I never had burmese but that looks really good! 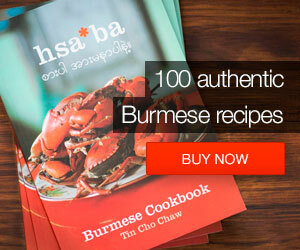 Hope you’ll try some Burmese recipes and let us know what you think. I am getting hungry as i had see the picture.I had apart so long time from father land and missing so much. can we make the same recipe with chicken instead of fish.pl do reply. i absolutely adore rakhine mote ti. Do you by any chance know how to make the atote version of rakhine mote ti? 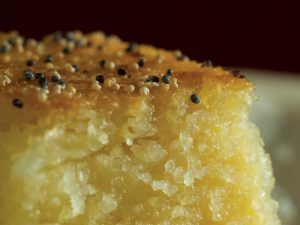 Also I have been trying to find a recipe for shwe yin aye. I have to get your cook book!! Thank you so much for this site!